In winter, you can take the ski lift Cadepunt in front of our Garni which is connected to the entire ski area thanks to our ideal location directly on the runs. 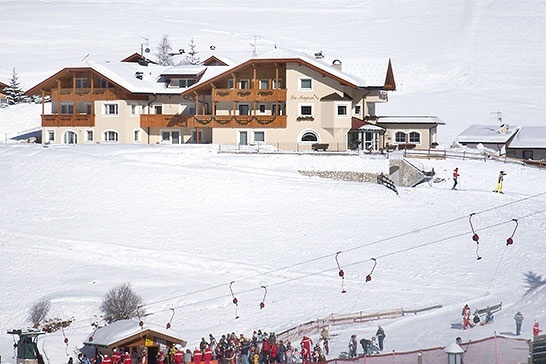 In fact, our garni-hotel, besides offering a fascinating view of Selva, enables our guests to put on their skis in front of our house and leave for a ski tour for beginners or advanced skiers, e.g. the Sellaronda, only to return right to the hotel again with their skis on. 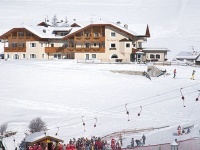 The slope �Cadepunt� in front of our house, being a run for beginners and also the meeting point of the local ski-school, is much appreciated by guest-parents. They can watch their junior's first skiing performances staying on the balcony of their room/apartment. The well-prepared cross-country track that leads to the idyllic Vallunga has its starting-point only a few meters from our garni-hotel.